While 1986 was a big year for films—with a varied slate of movies including Top Gun, Platoon, Back to School, Aliens, and Ferris Bueller’s Day Off dominating the box office—it was an even bigger year for film critics. On September 13, 1986, Siskel and Ebert and the Movies made its television debut, and turned arguing about films into a national pastime. 1. IT WASN’T THE FIRST TIME GENE SISKEL AND ROGER EBERT DISAGREED ABOUT MOVIES ON TELEVISION. Throughout its lifespan, what eventually became known as At the Movies adopted (and discarded) a variety of titles. Though the iconic film review series began its run on September 13, 1986 as Siskel and Ebert and the Movies, it wasn’t the first time Gene Siskel and Roger Ebert had collaborated on a television program. From 1975 to 1982, the two critics had co-hosted the PBS series Sneak Previews. And yes, they often disagreed about the quality of the movies they reviewed. 2. A COIN TOSS DETERMINED WHOSE NAME WOULD BE LISTED FIRST IN THE TITLE. According to the Archive of American Television, Siskel and Ebert determined whose name would come first in the title of their new show in the fairest, most democratic way they knew how: a coin toss. 3. THEY USED TO HAVE A DOG SIDEKICK, THEN A SKUNK. For all their intelligent opinions about movies, Siskel and Ebert weren’t above using a fun little gimmick here and there—going all the way back to Sneak Previews. First there was Spot the Wonder Dog, who helped the duo declare the worst movie of the week (a.k.a. the “dog”). When asked about the canine cineaste, Ebert told The Washington Post, "You want the story of Spot, I'll tell you the story of Spot. Spot was fired by PBS because of his salary demands. He was getting $40 a week." There were other dogs, and then Aroma the skunk, who introduced the critics’ Stinker-of-the-Week. Siskel and Ebert popularized the concept of a thumbs up/thumbs down rating system, with “two thumbs up” being the holy grail for any filmmaker lucky enough to have his or her film reviewed by the duo. To maintain the sanctity of that glowing accolade, Siskel and Ebert trademarked the phrase. "We made television history, and established the trademarked catch-phrase 'Two thumbs up,'” Ebert once explained. 5. DISNEY CLAIMED THAT EBERT FORCED THEM TO PULL THOSE THUMBS DURING ONE HEATED CONTRACT NEGOTIATION. In 2007, Disney-ABC Domestic Television issued a statement claiming that Ebert had forced them to pull the thumbs from the show (which, by that time, was At the Movies with Ebert & Roeper) in the midst of a contract negotiation. In response, Ebert claimed that he "had made it clear the Thumbs could remain during good-faith negotiations," despite what the press release said. He went on to explain that, "They made a first offer on Friday which I considered offensively low. I responded with a counteroffer. They did not reply to this, and on Monday ordered the Thumbs removed from the show. This is not something I expected after an association of over 22 years.” When Ebert eventually ended his association with the show, the thumbs went with him. 6. THEIR FREQUENT DISAGREEMENTS WERE THE SHOW’S MAIN DRAW. Any fan of Siskel and Ebert and the Movies can tell you that some of its best moments came when the critics were in serious disagreement about a movie. And while the critics themselves knew that their frequent differences of opinion were one of the show’s main draws, their relationship was based on fierce mutual respect. 7. THEY FOUGHT HARDER FOR EACH OTHER THAN THEY DID AGAINST EACH OTHER. Though Ebert acknowledged that he and Siskel often disagreed on movies, when it came to real life, they always had each other’s backs. “In my darkest and moodiest hours, when all my competitiveness and resentment and indignation were at a roiling boil, I never considered [going our separate ways],” Ebert wrote. “I know Gene never did either. We were linked in a bond beyond all disputing. 'You may be an a**hole,' Gene would say, 'but you're my a**hole.' If we were fighting—get out of the room. But if we were teamed up against a common target, we were fatal. When we were on his show, Howard Stern never knew what hit him. He picked on one of us, and we were both at his throat." 8. IN ADDITION TO REVIEWING MOVIES, THEY TALKED ABOUT THE STATE OF MOVIEMAKING. 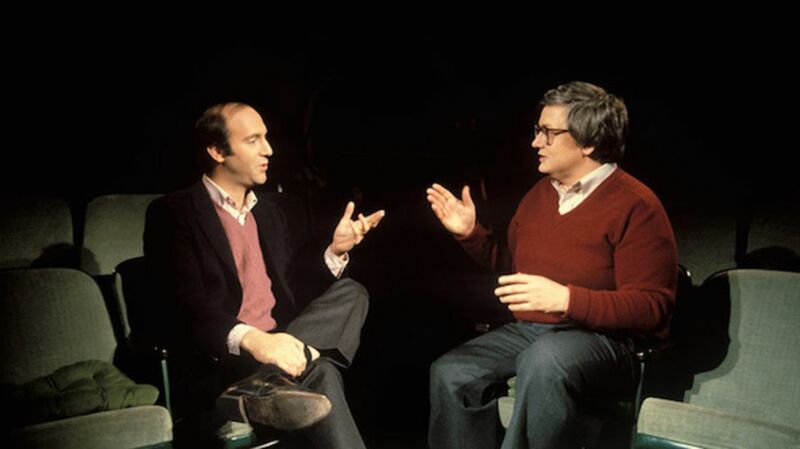 Though reviews were their main business, Siskel and Ebert worked hard to develop an appreciation for the art of cinema itself in their viewers. In an editorial for Film Comment in 1990, Ebert reminded readers of the many themed issues he and Siskel had produced where they delved into issues facing moviemakers of the day, including the colorization of films, the virtues of letterboxing, the art of black-and-white cinematography, and why the MPAA was the same as censorship. "Siskel & Ebert was the first, and often the only, television show of any kind to deal with many of these subjects,” Ebert wrote. “It would be fair to say that most mainstream Americans who have formed an opinion on colorization and letterboxing were inspired to do so because of our program. (Video retailers say the Siskel & Ebert program on letterboxing caused a noticeable swing in the opinions of their customers on the subject.)" 9. THEY FILMED AN EPISODE IN BLACK AND WHITE. To illustrate that aforementioned point about black and white cinematography, Siskel and Ebert filmed an entire episode in black and white. 10. THEY TURNED AUDIENCES ON TO A NUMBER OF INDEPENDENT FILMS AND DOCUMENTARIES. 11. A BAD REVIEW OF THE FISHER KING LED TO A VILLAIN NAMED SISKEL IN THE REF. Ahead of the 1992 Academy Awards, Siskel and Ebert ran a pre-Oscars special in which they discussed that year’s nominees and Siskel declared Terry Gilliam’s The Fisher King, written by Richard LaGravenese, among the least deserving nominees. "I thought it was overwrought," Siskel told the Los Angeles Times. Two years later, while at a press screening of Ted Demme’s The Ref, also penned by LaGravenese, Siskel noticed something odd: The bad guy’s name was Siskel. The critic had no idea why the screenwriter would have any ill will toward him, until LaGravenese confirmed through a publicist his reasons for using Siskel’s name. 12. SISKEL LIKED JOHN WOO’S BROKEN ARROW, UNTIL EBERT DIDN’T. One of the duo’s most memorable reviews was, ironically, of a pretty unmemorable movie: John Woo’s Broken Arrow. It marked the only time on the series where Siskel changed his opinion (and the direction of his thumb) after hearing Ebert’s take on a film. He changed his thumbs up to a thumbs down on the air to make it a unanimous stinker. 13. THE BALCONY SEATS WERE EVENTUALLY DESTROYED.